Coconut milk is so smart in this!!! Love it! I so want to stock my fridge with this! The coconut milk addition sounds downright perfect, too. I would have never thought! So funny, I always tell my clients there is no harm in trying things with your diet, none at all! Going gluten free – or processed food free- can help you improve your diet. I think people get tripped up when they buy ALL THE GLUTEN FREE junk food aisle!!! Gluten free cookies = cookies. This hummus looks amazing, looking forward to your recipes! Yup. Not gluten free here either, but eating “real food” does make you feel better. Pushing 40 now and wow, what a different it makes….the food you feed you body is food needed as fuel. Eat to make you feel well and with recipes that tickle your taste buds like this…perfect. 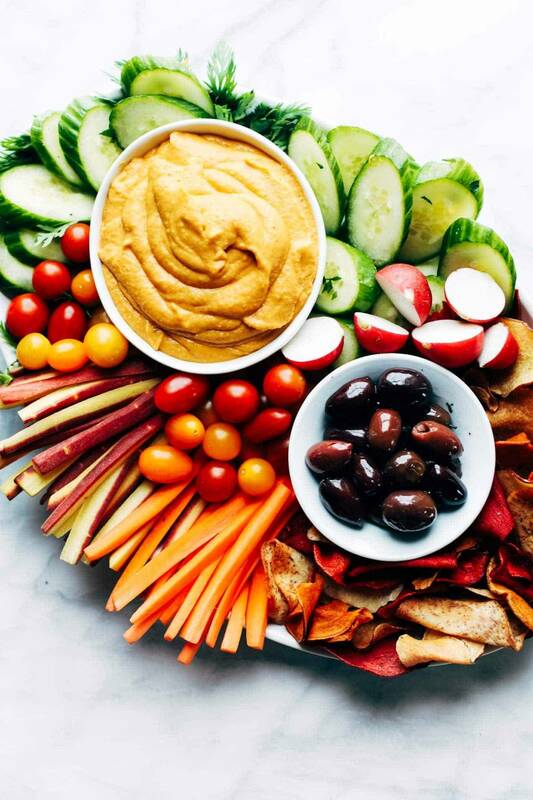 That is SUCH a beautiful picture of the platter – it makes me want to eat veggies and make that hummus RIGHT NOW!! Right!? Hope you enjoy it, Jennifer! WOW! This looks so amazing. I love hummus and I’ve just recently started experimenting with making my own, I’m making this next for sure! How could you NOT want to eat veggies when you make them look this pretty?! This hummer looks amazing! I am thrilled about this new series! Going GF isn’t a necessity for me either, however, I love the way I feel when I omit gluten from my diet for a period of time. This series couldn’t come at a better time for me as I was just thinking the other day that I need to give my body a little “re-boot” again before my upcoming summer vacation. Looking forward to what you post next! Really great hummus recipe!! Looks creamy and luscious! I love the added coconut milk!! I could snack on this all summer long!! So that was a quick turnaround. Thanks for helping me avoid eating tonight’s dinner for lunch! I never have all the ingredients so I substituted green curry paste for red. Still delish, goes well with whole wheat crackers, broccoli and some spicy sardines! Maybe an odd combo but I’m happy and looking forward to snacking for a couple of days. Huzzah! I don’t eat gluten free either, but I love hummus and all things vegetables. This hummus looks delicious! Hope you enjoy it, Katherine! This looks so good that I’ll have to make my own curry paste because it’s impossible to find such things in my small town. No complaints, though, I’m sure I won’t find it hard to use it up. I’m coming over to your place for drinks and nibbles! (I’ll bring wine!) That looks delicious!!! I’ve just started making my own hummus and I love the thought of it being curry flavored. Also, your photos are gorgeous! Coconut milk! What a clever addition to hummus. I’m sure it’s perfect with the curry flavor. <3 I'm sure Afton's happy his mama is starting to take care of herself again. Glad you enjoyed it, Sommer! This hummus looks so tasty and its a bit different from the normal kind (of which I eat way to much). Thank you for sharing. The plate looks absolutely amazing! I would never have guessed this recipe had as much protein as it does! Thank you, love to skip bread too it just kinda drains energy for me at least, and love the extra spice punch too! This looks so good! Just a question is there no tahini in this for a reason? I just assumed all hummus’ had tahini in it. It isn’t necessary, but feel free to add it if you like the taste!